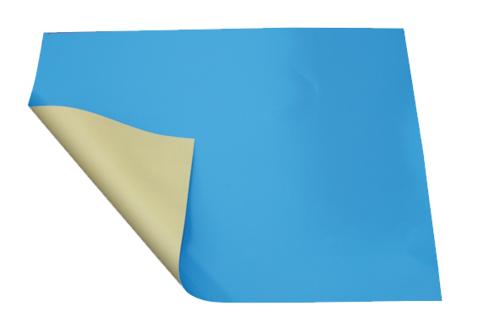 Keep your pool in perfect conditions with our range of products: Tarps for swimming pools, covers for swimming pools, thermal blanket for swimming pools ...Choose the pool cover that best suits your needs and keep the temperature of your pool in perfect condition. 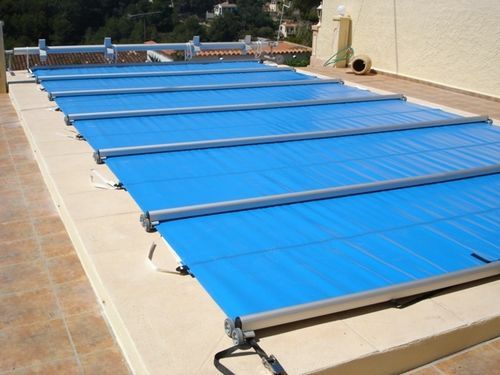 Solar cover Sol+Guard 500 micras specially designed solar blanket to heat the pool using solar energy, easy to instal and to use. 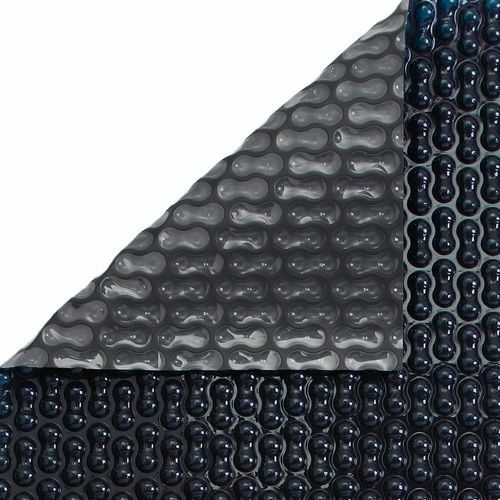 Energy Guard black solar blanket 500 micras designed especially for the protection and heating of the pool. Termic pool cover 400 micras. Increase your swimming pool temperature while you avoiding falling dirt. 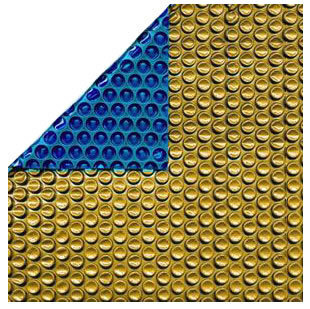 Solar cover of 500 microns gold color Geobooble double bubble technology for better performance. The edge stitching around the heating element can engage the reel and prevent friction of your product. 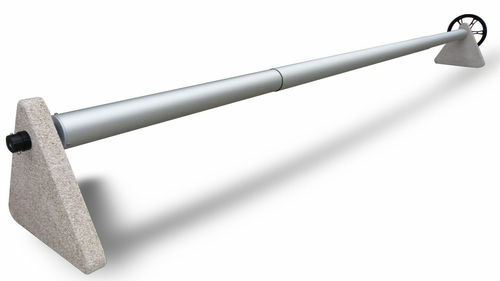 Mobile reel telescopic tubes and stainless steel brackets 75 mm. diameter for measures 4 to 5.50 meters. Mobile reel telescopic tubes and stainless steel brackets 100 mm. 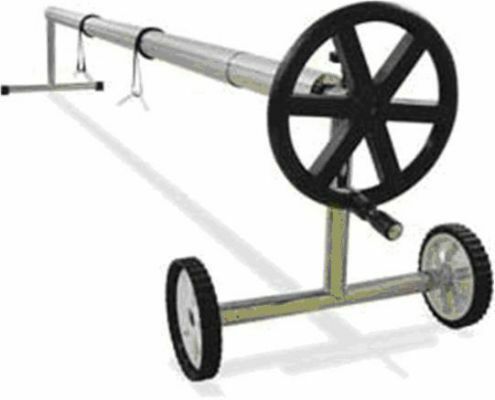 diameter for measures 4 to 7,25 m.
Telescopic furler model plus pools from 4 to 5.5 meters. Very easy and comfortable to use. Telescopic reel with 2 steering wheels for ease of use for swimming pools from 5.50 to 7.25 meters. Mobile Reel with anodized aluminum telescopic tubes of 110 mm diameter pool of 2.5 to 6.90 m wide. 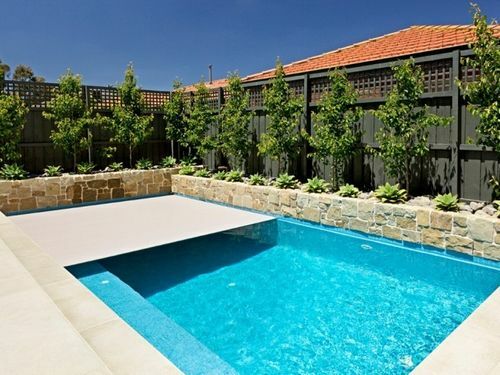 Telescopic pools with stone supports for pools from 4 to 5.5 m wide furling. Quality and elegance. 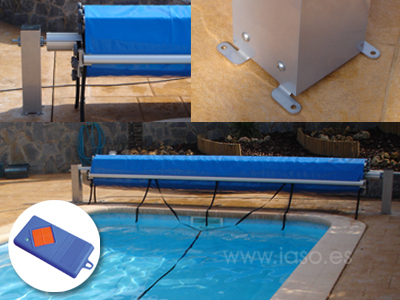 Winder for large pools. Aluminum and stainless steel. 316. Aisi tube Ø 160mm and 3mm thick. Winder for above ground pools. 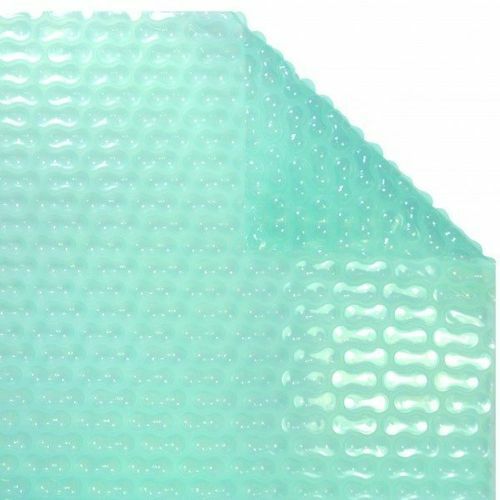 Pick up your mat or blanket in its elevated pool Gre quickly and easily. The motorized roller is valid for all sizes of sliding cover. Very easy and comfortable to use. 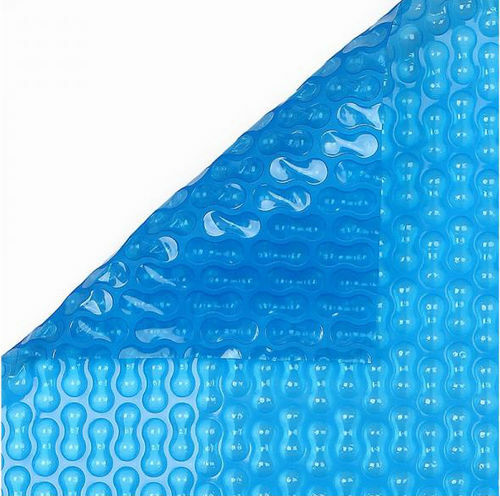 Protective cover from 3 meters to 7.2 meters long in PVC length with zipper for pool reels. Special motorized furling for our bar blanket. Pick it up more comfortably. Reel telescopic pool from 5.50 to 7.25 meters to extend the cover. Very easy and comfortable to use. Cover your pool during the winter with one of our blankets or tarps with exclusive locking system with adjustable turnbuckles. Safety bar cover for winter and summer. Protect both your pool and people with only one cover. 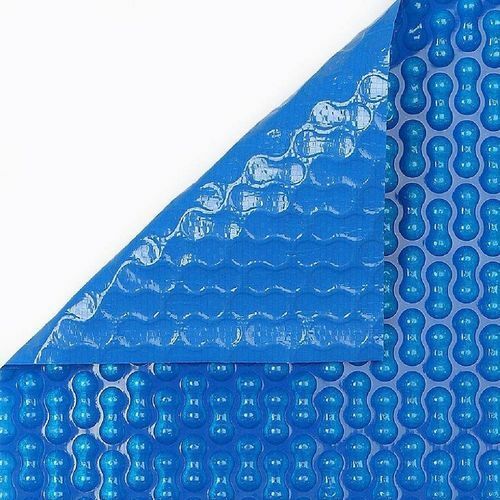 Cover your pool with the slide cover will protect your pool from dirt and you and your family from potential accidents. Cover your pool with the slide cover with electrical roller with will protect your pool from dirt and from potential accidents. Floating cover reel 6 x 3 meters. Easy installation and perfect finish. 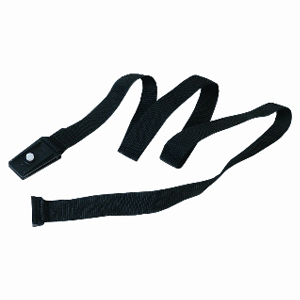 Set of 6 straps for the thermal blanket with the clips included to hold your solar cover..